Over the last 24 hours, as they've been sailing up the Brazilian coast, neither Spindrift 2 nor IDEC Sport have managed to stop the rot, with the deficit on their 'virtual rival' and present Jules Verne Trophy record holder, Banque Populaire V further increasing to 614 miles at 1000 UTC this morning for Spindrift 2 and to 1016 miles in the case of IDEC Sport. In the 10-15 knot upwind conditions around the northwest side of the St Helena high, the crew of the mighty Spindrift 2 has managed to keep their 40m long maxi-trimaran perched on a truly impressive 18-20 knots of boat speed. Sailing into a header, last night at 2200 UTC the world's biggest racing trimaran tacked on to starboard. With the wind continuing to veer as she heads north, her present course should see her get around Recife (the easternmost tip of Brazil), still almost 700 miles further up the race track. Francis Joyon and his smaller crew on board IDEC Sport have been feeling the pain more. Relative to the St Helena high they were still too far south to see the wind veering into the north/northeast yesterday and so have had to tack back on to port. They are currently in a similar position to Spindrift 2 yesterday - on a northeast course sailing into a header and waiting for the right moment to make their final tack north enabling them too to get around Recife. This should occur sometime this evening. From here there is nothing especially ominous-looking in the weather for the remainder of the week. Both Spindrift 2, and IDEC Sport after she tacks tonight) will see the South Atlantic trade winds continue to veer into the east and eventually the southeast as they head north up past Recife and on to the Equator. 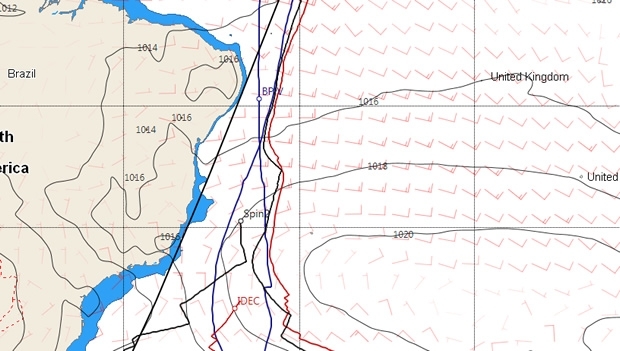 With any luck they should cross the Doldrums without too much fuss and, as we reported yesterday, the make or break of their records will be down to the position of the Azores high - how badly it is blocking their path to Brest. And this coul not only affect the progress of the two boats relative to Banque Populaire V's progress, but between themselves too. At present the GFS forecast has the high centred south of the Azores on 3 January, meaning that Spindrift 2 is likely to have to sail a similar distance west to sail around it as Banque Populaire V did, but might then be able to take a more direct course towards the finish line, depending upon how her progress enables her to hook into the fronts south of the relentless stream of depressions thundering across the North Atlantic at this time of year. However it is still way too early to second guess what the weather in this part of the ocean is going to do at this particularly volatile time of year. - A welcome low would allow us to reach Brittany quickly. - A barrier could leave us with no route through.